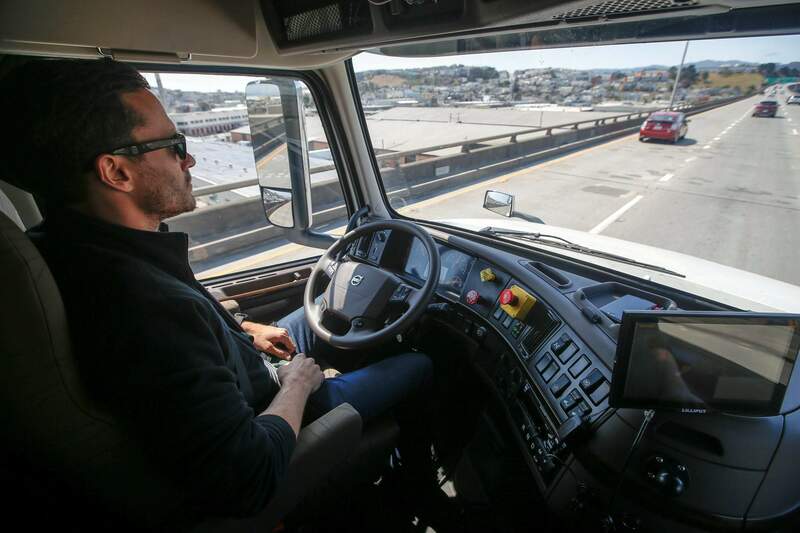 Matt Grigsby, senior program engineer at Otto, takes his hands off the steering wheel of a self-driving, big-rig truck during a demonstration on the highway in San Francisco on Aug. 18, 2016. The liquor industry is lobbying to speed up self-driving technology, believing self-driving vehicles will increase liquor sales. NEW YORK – Automakers and tech firms have long been the ones hustling to get self-driving cars on the street. But they’ve lately been joined by a surprise ally: America’s alcohol industry. In recent weeks, two industry groups – one representing wine and liquor wholesalers and another representing large producers – have thrown their weight behind coalitions lobbying to get autonomous vehicles on the road faster. Inherent in their support, analysts say, is an understanding that self-driving cars could revolutionize the way Americans drink. Brewers and distillers say autonomous vehicles could reduce drunken driving. “It makes a lot of sense that the industry is interested,” said Jim Watson, a senior beverage analyst at Rabobank, the multinational finance firm. That same week, the Foundation for Advancing Alcohol Responsibility – an industry-funded nonprofit that battles underage drinking and drunken driving – signed on in support of a pending bill that would speed the commercialization of self-driving vehicles. FAAR’s members include Diageo, Pernod Ricard, Bacardi and Constellation, four of the world’s largest liquor and beer producers. Both organizations say they are concerned about drunken driving and public safety. The industry has long supported technologies that keep impaired drivers off the road, such as alcohol sensor monitoring and ignition interlocks, said Ralph Blackman, FAAR’s president and chief executive. But despite a steady, long-term decline in drunken driving rates, alcohol-related crashes still kill 28 people each day, according to the Centers for Disease Control and Prevention. Studies of ride-sharing services such as Uber and Lyft, which give drinkers easy, affordable alternatives to driving their own car, have generally shown that they decrease drunken driving accidents. Similar observations have been made of public transit: When the Washington, D.C., metro extended its hours, DUI arrests in nightlife districts fell. At the same time, other alcohol-related arrests in those areas jumped, probably because people stayed out later and drank more, said Brad Greenwood, a researcher at the University of Minnesota who studies the unintended effects of technological innovations. New sales aren’t the only way that the alcohol industry stands to benefit from self-driving cars, said Watson, the Rabobank analyst. For years, the industry has also suffered through a major social shift, with consumers drinking more at home and less at restaurants and bars. If autonomous cars can push some drinking back outside the home, Watson said, alcohol producers and retailers will be able to take advantage of higher margins and better brand recognition there. On top of that, autonomous delivery trucks could significantly reduce labor costs for distributors. Brewing giant Anheuser-Busch partnered with car technology company Otto in 2016 to transport a shipment of beer across Colorado – the world’s first commercial shipment by self-driving truck. The company has placed pre-orders for 40 Tesla semi-trucks with “autonomous driving capabilities,” the company said in a December statement. Most experts believe self-driving technology will come to trucks and other commercial vehicles before it is widely available to consumers. But Greenwood, the technology researcher, says it would be short-sighted to ignore the “spillover effects” of self-driving technology. This is one innovation, he argues, that could have far larger implications beyond drunken driving.